A. Make sure your egg whites are at room temperature. B. Sieve together the almond flour and confectioner’s sugar. C. Use parchment paper to line your cookie sheets. 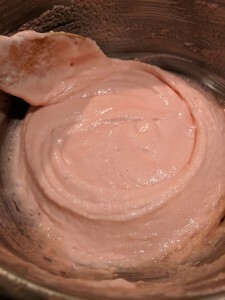 D. When you fold the almond flour mixture into the egg mixture near the end of the recipe, it should be fully incorporated, but not over-mixed. Just keep gently folding in the flour until it’s smooth, yet thick like molten lava. E. Let the cookies sit for 30 minutes in the cookie sheets before baking. F. Cook only one pan at a time. Trick: You can place the 3 (whole) eggs in a bowl of warm water for 5 minutes to get them to room temperature. 1. 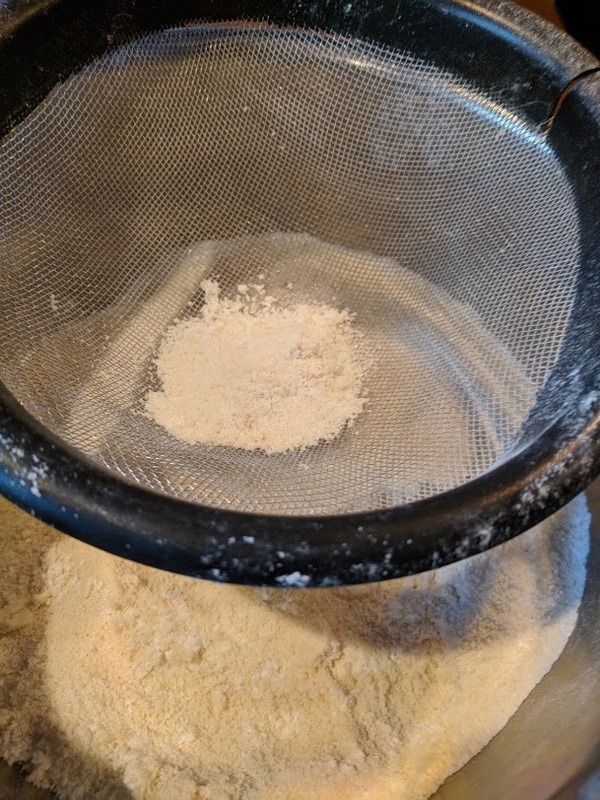 Put the almond flour and the confectioners sugar through a sieve. Mix together in a bowl and set aside. 2. Beat egg whites in a mixing bowl with a hand mixer until frothy. 3. Beat in cream of tartar. 4. 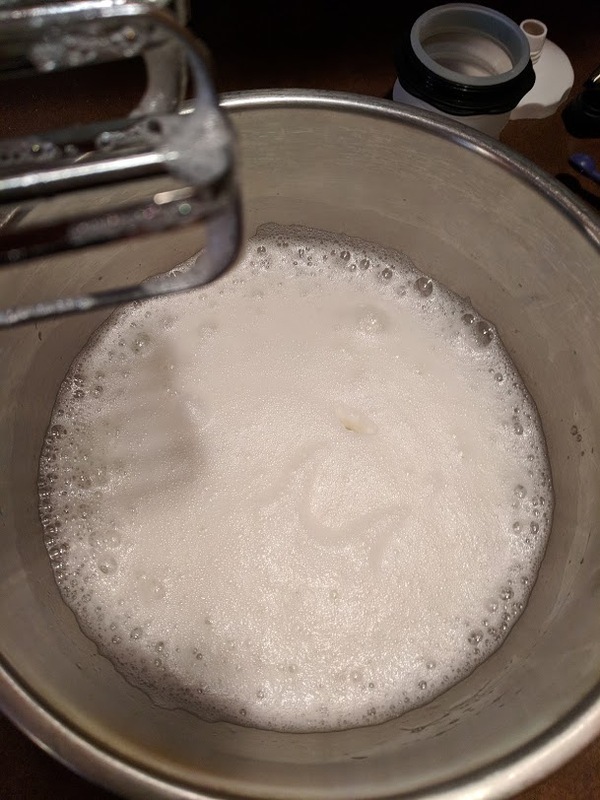 Slowly beat in granulated sugar. 6. Keep beating until you have stiff peaks. 7. Beat in the food coloring. You should make it a little darker than the shade you want your cookies to be because the color will lighten a little when it bakes. 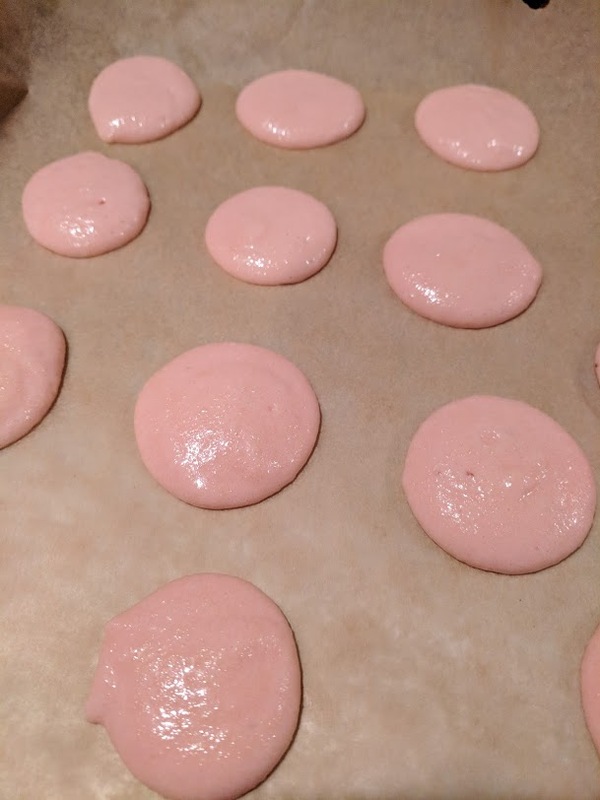 I used red food coloring to make pink macarons for Valentine’s Day. 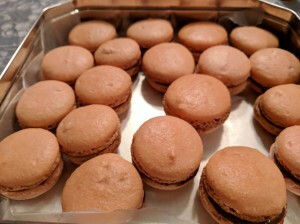 Next month I plan to make green macarons for St. Patrick’s Day. 8. 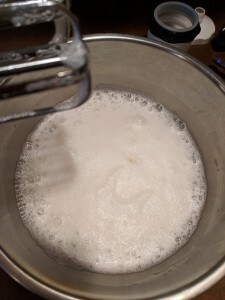 Using a wide spoon, fold half of the almond flour mixture into the stiff egg mixture. 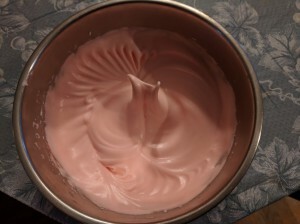 Tip: To fold, gently run the spoon along the bottom of the bowl moving upwards to fold the mixture over onto itself. 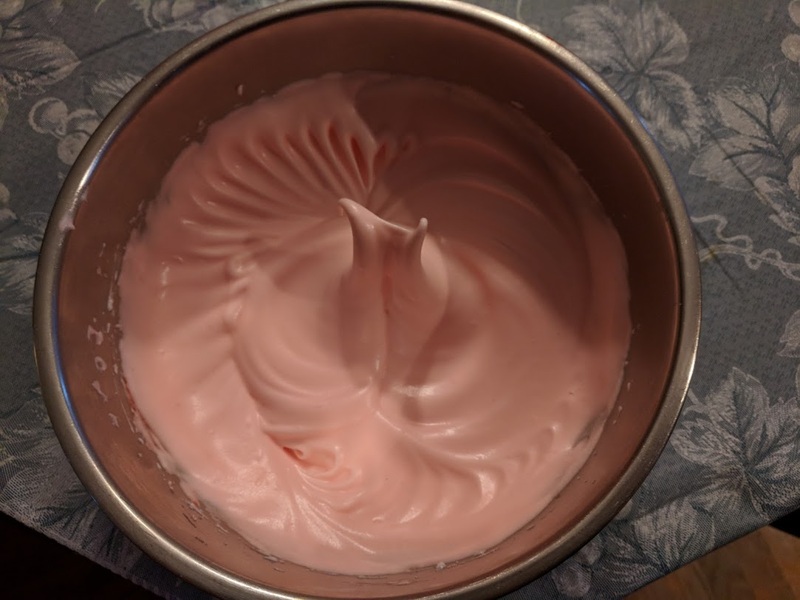 Keep turning the bowl to get the different parts of the mixture folded together. 9. 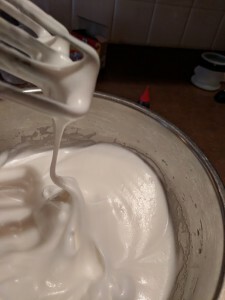 Fold in the other half of the flour mixture until it just becomes smooth. It should be thick like molten lava. But don’t overdo it. 10. Set up a pastry bag with a 1/2 inch (about 1.3cm.) tip. 11. Place the batter in the bag. Line cookie sheets with parchment paper. 12. Pipe out 1 to 1 1/4″ rounds (2.5 to 3 cm.) with an inch or more in between each round. They should all be about the same size. 13. Clack the cookie sheets (with the piped out cookies) straight down on the countertop. Turn 180 degrees and clack again. This motion should smooth out your cookies. 14. Let sit in cookie sheet for 30 minutes before baking. 15. Meanwhile preheat the oven to 300F (150C). 16. Cook for 7 minutes. Turn cookie sheet 180 degrees and cook for another 7 minutes. They should be slightly golden. 17. Let cool on cookie sheet. Transfer cookies to a cooling rack. If you have that crinkly part on the bottom of the cookies it means you did it correctly! That part is called “feet”. 18. Once they’re completely cooled off you can put the filling on one cookie, on the side that’s not shiny. 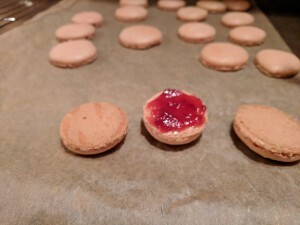 Gently cover it with another cookie (shiny side facing out). 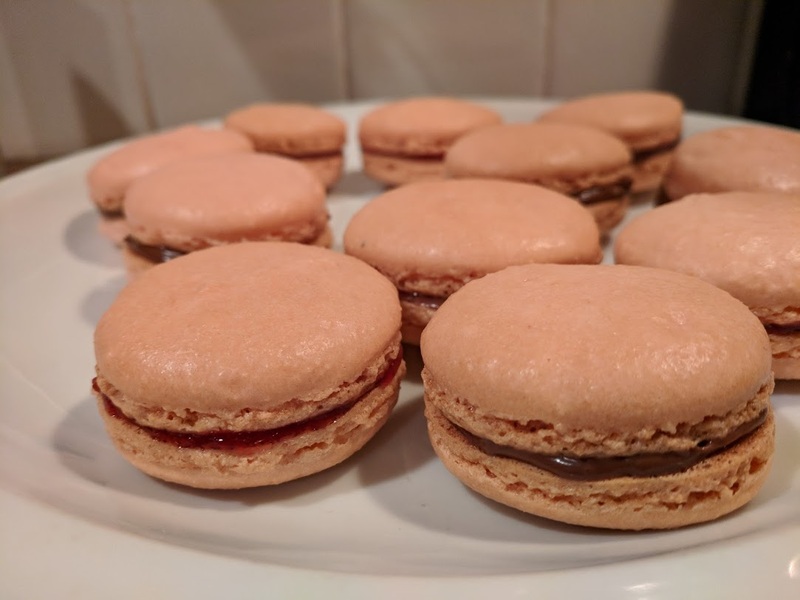 I filled half of my macarons with raspberry preserves and the other half with Nutella. We all preferred the raspberry preserve filling. It tasted better with the almond. You can be creative with your fillings and try different types. Read more about the History of Macarons, Macaroons, Macaroni at Slate. 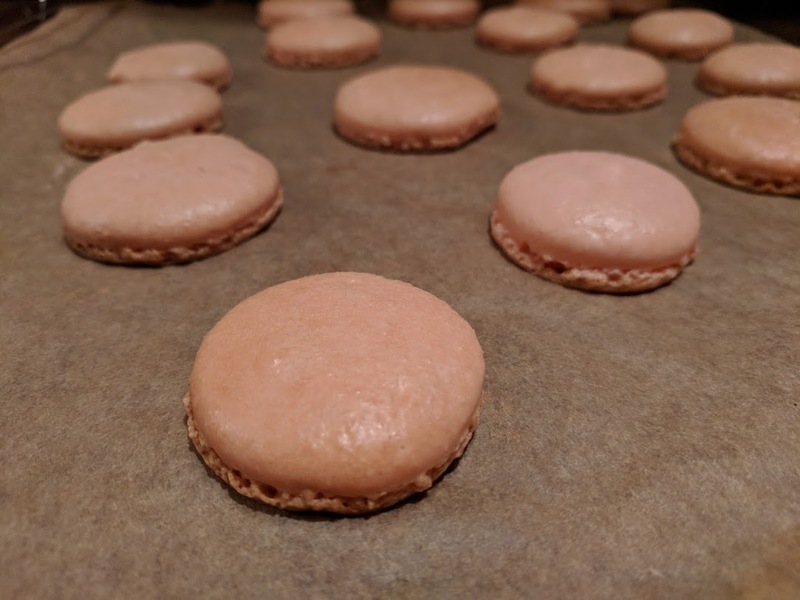 This article was posted on Wednesday, February 7th, 2018 at 8:22 pm	and is filed under Cookies, Countries & Cultures, Cuisine, Desserts, France, French Cuisine, Recipe for French Macarons, Recipes of the World. You can follow any responses to this entry through the RSS 2.0 feed. You can leave a response, or trackback from your own site. 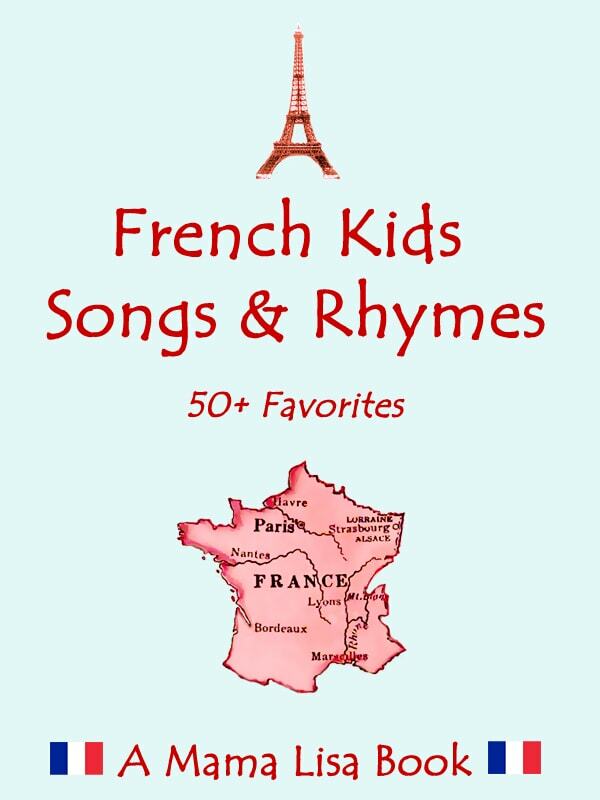 << Can Someone Help with a Rhyme of Unknown Origin?